The Toronto Maple Leafs are barely hanging on in the Eastern Conference playoff race. Injuries to their two leading scorers won't help their cause. The Maple Leafs will be without captain Mats Sundin and center Nik Antropov on Tuesday night when they visit the struggling New York Islanders, losers of five straight. Sitting 12th in the East and six points behind Philadelphia for the eighth and final playoff spot puts Toronto (32-31-10) in a very difficult position. The Maple Leafs only have nine games remaining and would need to move past Buffalo, Washington and Florida while also hoping the Flyers continue to struggle to avoid missing the playoffs for a third consecutive season. Toronto's fading postseason chances took another hit Saturday with a 6-2 loss to the Sabres. It was the third loss in four home games for the Leafs, who played without Sundin (groin) and lost Antropov to a knee injury in the first period. Neither is expected to play Tuesday, leaving Toronto without Sundin and Antropov's combined 58 goals and 129 points this season. Playing without Sundin - the team leader with 32 goals, 45 assists and 75 points - is difficult enough, but Antropov's absence leaves the Leafs extremely weak in the middle. Sundin is listed as day-to-day and could return by the weekend. No timetable has been set for Antropov's return. "(People) have a view of Mats Sundin, what he is and what he means to the team," Leafs coach Paul Maurice said. "But sometimes you don't get a glimpse of his intensity, and certainly his presence. One Leaf who could help fill the void is former Islander Jason Blake, who has had a disappointing season with 13 goals. "I think there's a good feeling in the room," Blake told the Leafs' official Web site. "I know we had a little letdown against Buffalo but we've been playing solid hockey for the last two months. There's a good feeling here, but we want to get to where we want to get to. With Mats out and Nik out, we just need a little bit more." Toronto is 1-1-1 this season against the Islanders, including a 4-3 overtime loss at Nassau Coliseum on Dec. 26. Including playoff games, the Leafs are 2-9-3 on Long Island since the start of the 2001-02 season. Playoffs don't figure to be a concern this season for the goal-starved Islanders (32-34-7), who are three points behind Toronto and one point ahead of 14th-place Atlanta in the East. On Saturday, New York suffered its sixth shutout loss of the season, 3-0 at Montreal. The Islanders, tied for last in the NHL with 176 goals, have scored only eight times during their five-game skid. Their longest losing streak of the season was seven games, from Jan. 24-Feb. 9. With their fate all but determined, the Islanders have called up top prospect Kyle Okposo from Bridgeport of the AHL to make his NHL debut Tuesday. "He's an exceptional player that we're looking forward to see play at the NHL level," Islanders coach Ted Nolan said. "There are certain players who have that instinct. He doesn't just skate and shoot the puck well, he also has that great hockey sense." 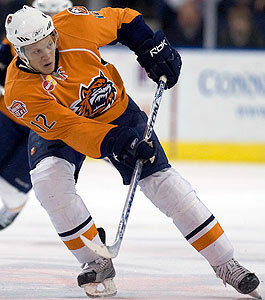 Okposo, the seventh overall pick in the 2006 draft, had eight goals and 16 assists in 29 games in the AHL.